Welcome to Linda Ikeji's Blog: The Countdown begins! - 3 days to go to RCCG's Excel 2012! The Countdown begins! 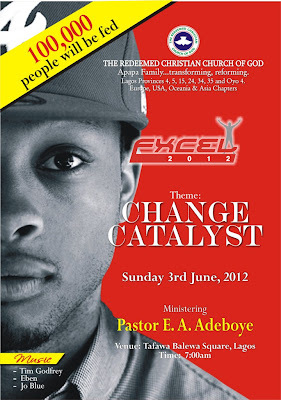 - 3 days to go to RCCG's Excel 2012! It's barely 3 days to the eagerly awaited Excel 2012, an exciting and inspiring event organized by the Redeemed Christian Church of God - Apapa Family. Online platforms and social media networks are abuzz with anticipation for the event. "I'm looking forward to having an amazing time at the event, especially as Pastor E.A Adeboye and musicians like Eben are ministering." Tweeted Valerie Adeleke, a university student on twitter. Many youths are looking forward to this year’s edition as the theme for the celebration CHANGE CATALYST is geared towards promoting the role and impact of the youths as core agents of change and the change catalysts in our society. With musical performances from Eben, Tim Godfrey and Nigerian Idol finalist Joe Blue, Excel 2012 promises to be an atmosphere of celebration which would be remembered by attendees for a long time. “Excel 2012 is just three days away and we can’t wait for it to begin. Everything is in place, and participants at the event are in for a great time. We believe in the future of Nigeria and the divine mandate given to us by God is to engage our youth and release them as agents of change in the society.” Said the official statement from RCCG Apapa Family, organisers of Excel 2012. Other exciting activities to take place at the launch include the endowing of a professorial Chair in Mathematics at the University of Ife by Pastor E.A. Adeboye. This would be in addition to the existing ones he had already endowed at the University of Lagos, University of Ibadan and University of Nigeria Nsukka. A mentoring institution for youth leaders called The Excel Academy would also be officially launched at the event. Excel 2012 is the 5th edition of Excel Celebration, an annual gathering/celebration of The Redeemed Christian Church of God Apapa Family. Hope the Church is big enuf o....cos I'm coming with everyone on my street.